Keeping patient data under lock and key can help minimise the IT burden for healthcare organisations ahead of GDPR. Ten years ago, Apple introduced the world to the iPhone and in just one decade, the pocket-sized device has left an immeasurable impact on our lives. The iPhone has set a new industry standard for mobile devices, revolutionised mobile communications and is starting to make a big impact on healthcare. Upon deploying Apple’s technology, healthcare organisations quickly realised the multitude of benefits that the iPhone affords caregiving and non-caregiving staff, as well as patients. It boosted staff productivity and the delivery of healthcare, and simultaneously enhanced the patient experience and communication. Hospitals today are tapping into Apple’s healthcare capabilities, including CareKit and ResearchKit, to develop custom apps that manage patient care and conduct critical medical research. In addition, caregiving staff use iPhones to access medical records securely on-the-go, monitor patient vitals and easily communicate with patients. The iPhone’s capabilities continue to pave the way for the evolution of healthcare and the patient experience. However, in light of the recent WannaCry ransomware attack that wreaked havoc throughout the NHS, it’s critical for healthcare organisations to consider how devices are managed. 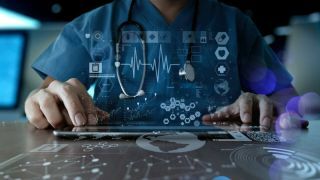 Healthcare organisations need an appropriate mobile device management (MDM) solution to ensure confidential patient data is kept secure, and devices are equipped with the latest security updates. In fact, a research commissioned by Jamf, and conducted independently by Vanson Bourne, polled 550 IT decision makers within healthcare organisations across the UK, France, Germany, US and Australia to learn more about the challenges facing healthcare IT key decision makers. Research results revealed that while IT decision makers are confident in the capabilities of mobile devices in healthcare, they are concerned about how these devices are being managed. What’s more, over a quarter (27%) of respondents are not fully confident in their existing device management solution. Other top concerns when managing staff mobile devices include security (83%), followed closely by data privacy (77%), inappropriate employee use (49%) and software updates (48%). An MDM solution is the best answer to the challenges outlined by key healthcare IT decision markets. By implementing a robust MDM solution, healthcare organisations can maximise the iPhone’s capabilities to keep patient data under lock and key, ensure that devices remain compliant with regulatory mandates, such as the upcoming GDPR, minimise the IT burden for healthcare organisations and improve employee’s work satisfaction. The recent WannaCry ransomware attack illuminated the challenges of managing confidential patient and caregiver data. It brought security to the forefront of industry conversations and simultaneously made security a priority for healthcare organisations across the globe. GPs, surgeries and hospitals need to assure both patients and staff that data is secure, without compromising staff’s flexibility to access confidential patient data while on-the-go. Healthcare organisations can enjoy peace of mind when using iPhones equipped with a robust MDM solution. An MDM solution enables healthcare organisations to have greater control over security settings across an entire inventory of managed devices. Organisations can tap into an MDM’s remote management capabilities which allow hospitals, GPs and surgeries to deploy customised security policies such as passcodes, secure VPN or Wi-Fi network and supervision capabilities. With MDM, managing user profiles becomes an easier task. Organisations can maintain consistent user profiles, bringing the security settings across all profiles in line with an organisation’s unique security needs. In addition, a critical element of an MDM programme is that confidential patient data is stored on managed devices. By keeping data on secure iPhones, rather than an MDM server, it’s easy for organisations to remotely wipe an iPhone if it is lost or stolen. This way, healthcare organisations can be confident that staff and patient data is secure. Coupling the security capabilities of an MDM solution with Apple’s native security capabilities on iPhones, such as Touch ID which allows an authorised user to unlock a device with their unique fingerprint and hardware-based encryption that keeps confidential data secure, healthcare organisations can be sure that confidential data is secured under lock and key. In a complex and ever-evolving regulatory environment, it’s important that healthcare organisations can ensure devices adhere to new industry regulations, such as the upcoming General Data Protection Regulation (GDPR). With the remote management capabilities of an MDM solution, organisations are able to easily determine which devices are not compliant. Updates can be quickly deployed to bring these devices in line with new security regulations. With MDM, organisations can constantly adjust device security settings as healthcare regulations continue to evolve. The remote management capabilities of an MDM solution reduce the IT burden for healthcare organisations. Hospitals may configure devices remotely with MDM and deploy devices with “zero-touch,” meaning that staff iPhones are ready for use once they are powered on, as the devices are already equipped with organisation-specific software, profiles, security policies and wireless certificates. Once devices are in use, organisations can easily deploy over the air (OTA) updates or security patches to an entire inventory of iPhones, thereby minimising staff disruption. An MDM solution, especially one that leverages all the native capabilities of an iPhone, allows staff to enjoy the capabilities and benefits of the iPhone from day one. As devices are managed remotely, staff are unhindered to tap into the capabilities of the device. Doctors and nurses can utilise apps to update patient records, monitor patients’ progress remotely and communicate with one another on a secure platform. A MDM programme provides a unique and unparalleled user experience, which can ultimately lead to higher levels of employee engagement and satisfaction. All in all, an MDM solution enables healthcare organisations to bring out the iPhone’s full capabilities for both staff and patients, which include keeping devices compliant with industry regulations, securing patient data, minimising the burden of managing iPhones and improving employees’ work satisfaction. The iPhone will undoubtedly continue to drive healthcare innovations in areas such as the patient and staff experience. With a robust MDM solution in place, healthcare organisations can be confident to unlock the iPhone’s current – and future, and get closer to the realisation of digitalisation in healthcare.